Amy had it all – money, brains and beauty. And then the accident happened. 1314: A Templar Knight, Luc, is also running. He meets the wife of a former comrade, now blinded in a terrifying attack: Aimee. Taking her under his wing, they must journey together through a dangerous world. 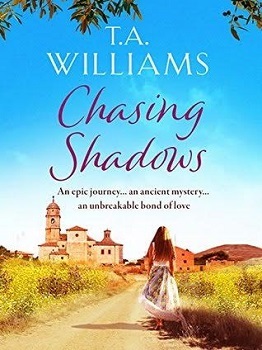 As they travel through the stunning scenery of Northern Spain, this couple, so very like Luke and Amy, emerge from the shadows of time carrying a treasure of inestimable value. 1- In spite of being blinded in an awful accident, Amy has still managed to go back to university and do an MA. Nowadays, with modern technology, blindness is far less of a handicap than it used to be. With the aid of a computer and some amazing screen reading software, she can research, study and write about her chosen subject with ease. 2- Amy loves dogs. In fact, although I haven’t mentioned it in the book, when she gets back to the UK, she’s going to get herself a guide dog. No prizes for guessing that this will be a lovely black Labrador! 3- Amy and her medieval counterpart share one main trait that helps them immensely. They are both stubbornly strong-minded in pursuing their goal. When you’re blind, you need a lot of self-reliance and resilience and both of my girls have it in spades. 4- Both girls “see” things with their other senses, particularly touch, and that includes everything from a Pyrenean Mountain Dog to their hunky companions. Amy also gets her friend to check Luke out and give her a description as well. As she says, “a girl’s got her reputation to think of”. 5- Both girls enjoy the sensation of looking after the man supposed to be looking after them when they get sick. Blind people are fiercely independent and being able to turn the tables and become the carer for a change is a good feeling. 1- When I wrote the first version of Chasing Shadows, Luke and his medieval doppelganger were absolutely huge. Having visited a number of arms and armour museums, I’ve seen how big and heavy the weapons were in those days and I felt the men had to be similarly massive. On reflection, they have now both reduced in size from enormous to simply big, tall and strong. 2- Luke is terrified of heights, as is his medieval counterpart. They both get that from me. I can get vertigo just from watching somebody on TV standing near the edge of a cliff. I don’t know why this is, don’t know how to cure it, but it seemed fair to extend this to my characters. 3- Luke likes his food. He’s like me in that as well. Like my old Labrador, if you put food in front of me, I’ll eat it. Luke does the same and there are some rather good meals in the book so if, like me, you have little will-power when it comes to eating, you might need to lock the fridge before reading certain passages. 4- Luke thinks the best car in the world is a Land Rover. His medieval counterpart doesn’t know what a Range Rover is, but I’m sure he would agree if he ever saw one. 5- Luke finds the cathedral in Santiago de Compostela to have a remarkable atmosphere, created by the accumulated joy of millions upon millions of people throughout the centuries who have slogged all the way along the pilgrims’ way to get there. I share this, too. It is a truly amazing feeling. You should try it for yourself some time. I hope very much you feel inspired to read Chasing Shadows and you enjoy it. I’ve written all sorts: thrillers, historical novels, short stories and now I’m enjoying myself hugely writing humour and romance. My most recent books are the What happens… series. 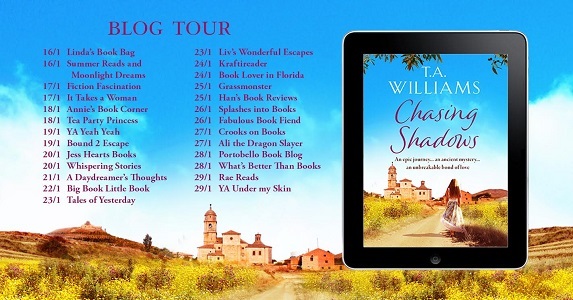 What happens in Tuscany reached #1 in the Amazon.co.uk Romantic Comedy chart and What Happens on the Beach, the last in the series, came out in July. Chasing Shadows is still romance, but with the added spice of a liberal helping of medieval history, one of my pet hobbies. I do a lot of cycling and I rode all the way to Santiago de Compostela on a bike a few years back. This provided both the inspiration and the background research for Chasing Shadows.